The city of London seems to have been following a real trend for high-altitude dining within the Square Mile, over the past few years. And joining the impressive skyline’s restaurants in postmodern structures such as The Shard (Aqua, Oblix, Hutong), Heron Tower (Duck & Waffle, SUSHISAMBA) and Tower 42 (City Social), is the newly opened Sky Garden that’s located across the top three floors of 20 Fenchurch Street – AKA The Walkie Talkie. 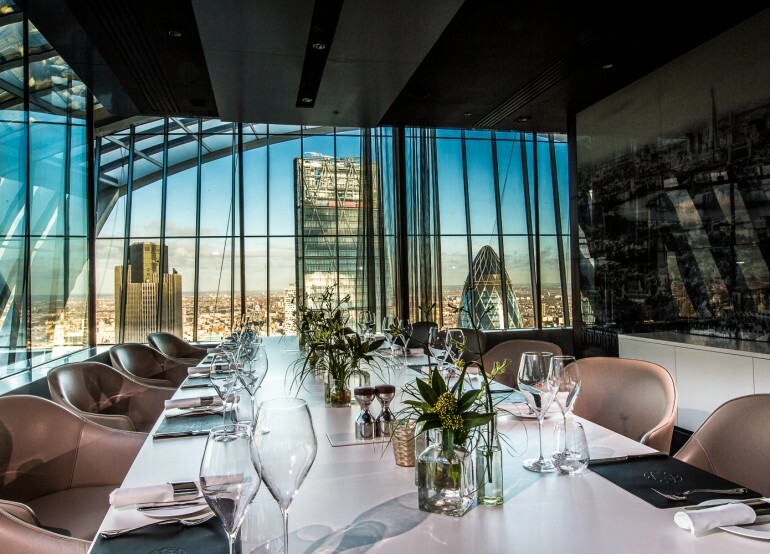 With three restaurant/bar options on offer, including the Sky Pod Bar, Darwin Brasserie and Fenchurch Seafood Bar & Grill, we decided to try out the latter – the building’s highest and most savvy of dining establishments. After a rigorous airport-like security check (be sure to arrive at least ten minutes early) we headed into the lift up to the tower’s 35th floor to the plant-filled viewing deck, greeted by a close-up view of the illuminated Shard, perched just south of the river, before ascending another two floors to the restaurant. All in all, the view from inside the restaurant situated in the centre of the building isn’t exactly spectacular, however having been fortunate enough to be seated in a prime position, I found myself paying vigil to the deftly lit St Paul’s Cathedral, the London Eye and a distant BT Tower, like a night watchman with a glass of Pinot Noir in hand, ready to dine amongst the clouds and tuck into some of the menu’s lauded seafood offerings. However, it was the seasonal game that took our fancy, on rifling through the selection of starters, ordering a deliciously rich Hare “Bolognese” enriched with walnut spaetzie and Berkswell cheese (£13.50) as well as the roasted Quail Breast (£12.50) with salt baked celeriac and a confit leg lollipop so delightful that a whole plateful wouldn’t have gone amiss. Each introduced with an unexpected amuse bouche of new potatoes dressed with goat’s cheese, breadcrumbs and chive. Moving on to the main course, the time had arrived for the restaurant’s namesake to shine through and impress. The whole Dover sole served with samphire, brown shrimp, capers and beurre noisette was tasty albeit pricey at £38, although the charming wait staff’s warning that the fish would be served on the bone was a polite touch. Meanwhile, the grilled half-lobster at market price wasn’t quite as substantial as would’ve been expected from a restaurant that specialises in fruits of the sea, with the garlic aioli taking centre stage as star of the dish. Having thought ahead, especially saving room to indulge in the dessert menu, the huge plate of caramelised pear was the perfect finale, refreshing and sweet, teamed with buttermilk ice cream and macadamia crumble while my partner’s decadent chocolate fondant accompanied by caramelised banana (a real show stealer), banana and yoghurt ice cream and honeycomb was just what’s needed to complete the evening’s feast. The Fenchurch Seafood Bar & Kitchen did provide an incredibly enjoyable dining experience, that’s recommendable for special occasions or fancy business dinners, with the charming, attentive staff taking things to the next level However, as reflected by the menu’s prices, it’s not only the restaurant itself that’s sky-high.